Sometimes the simplest things can make for wonderful abstract photographs. One holiday season I flew to Los Angeles to enjoy time with relatives. One decoration in their home was a wreath of white feathers. It was suspended over a west-facing window. Late one afternoon, I noticed that the setting sun illuminated the feathers from behind in a most beautiful way I quickly grabbed my camera, for I realized that the sun would soon set and what I was seeing would soon disappear for the day. 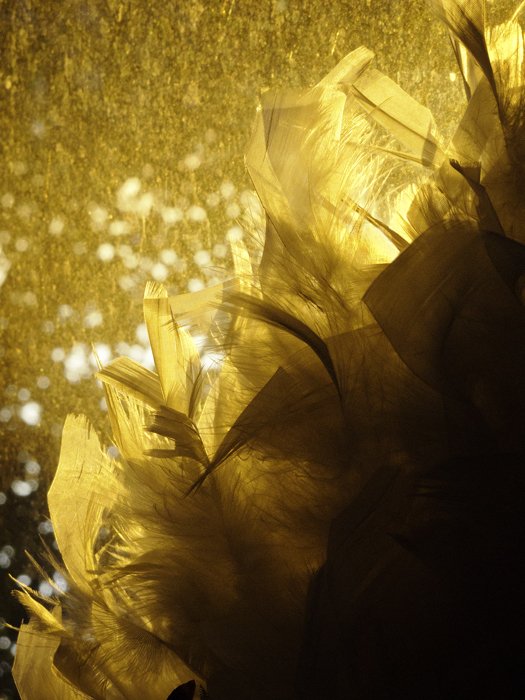 Using the short amount of time available, I had fun photographing the texture of the feathers and the quality of their illumination. I love the way that the window diffuses the horizontal light into a glittery spray of gold. Bushes growing about twenty feet beyond the window blocked most of the sunlight. Spaces in their foliage, however, allowed patches of white illumination shine through. In this image, there are three planes of light: the feathers, the window, and the bushes. The spray of gold is particularly beautiful.